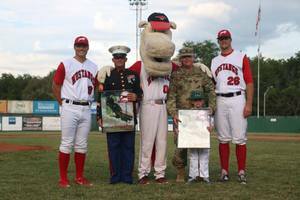 ST. JOSEPH, MO.- This July 4th at Phil Welch Stadium, the Mustangs have teamed up with the Local Carpenters 100 to raise money for an Honor Flight affecting local military veterans. The Mustang players will wear special Military Camo Jerseys. The game worn jerseys will be auctioned off during the game with those proceeds going to Kansas City Honor Flight. Several area veterans for the Honor Flight from World War II and the Korean War will be in attendance that evening. Among them, Earl Hammer, 97, Savannah, Missouri, who served as a Sergeant in the Marine Corps during WW2 in air traffic control. Eagle Communications will hand over several checks from area businesses for the Honor Flight that evening. Following the game there will be a special patriotic Mosaic Life Care Fireworks Spectacular. All area veterans will receive a free ticket and dinner on the Mustangs Party deck while supplies last. To reserve your spot on the Hy-Vee Party Deck or for more information call (816) 279-7856 or visit the Mustangs ticket office located within the stadium.